Get the most of BlackBerry, Android, Apple App Store, iPhone, Windows Mobile and other smart phones. Working on the move is the buzzword these days. In fact it has become a trend. Here we have deeply taken note of few top apps for mobiles through which you can view, edit and also create documents on the move. Documents To Go is one of the most popular and most in demand document editing application for smart phones. This app is made for all mobile platforms and it also has features like Word To Go, Spreadsheet To Go and Slideshow To Go in it for viewing .doc, .xls, .ppt, .pdf, .htm, .txt, .jpg, .gif, .png, .tif and .bmp files. All the options of these are available as it is in computer. is a specially made for all types of document organisation and storage app. It can save till 1GB worth of files free by using Box.net’s online storage. 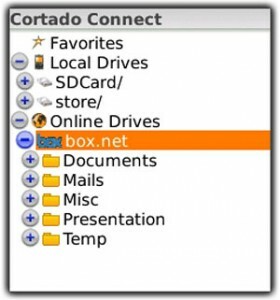 In Cortado Connect one can easily open and view documents and organise files. Cut, copy, paste, delete, rename and also the create functions are very easy with this Cortado Connect on BlackBerry. It is one of the most useful tools if you need to securely store documents and access it on your BlackBerry and PC. For spreadsheet editing on BlackBerry GridMagic is much better than the Spreadsheet To Go. It is commonly said by users that GridMagic is more closer to Excel on BlackBerry. In GridMagic the formatting options are much more flexible and one can easily edit documents and reformat cells and text. Cut, copy and pasting of cell data and insert/delete cells, rows and columns are all easy. There is one more important function in it. The workbooks are password protected according to wish and hence confidential documents are safe. This app also integrates easily with other BlackBerry functions such as email, phone numbers and the web. eOffice is a suite of applications on BlackBerry. With eOffice you will get useful tools to edit Microsoft Word, Excel and PDF documents. With the help of this it is very easy to access files from computer directly through the BlackBerry and can also easily send documents as attachments. eOffice allows for an easy editing of Microsoft Word documents. It also gives good access to all the functions of Spreadsheet. It is Microsoft Excel compatible. Not to forget its more useful features that support for viewing PowerPoint, PDF, CSV, faxes and image files straight from an email attachment with a magnifier. In the next article we will continue with some more useful apps of smart phones. So enjoy the full features of your BlackBerry, iPhone, Windows Mobile, Symbian, and whatever smart phones is available in the market. So, no stopping of work. Always work on your move.